Legend, atmosphere, history and spirituality among women alone! The village and its story, though, is hardly complete without telling of the only Island in Lake Orta, San Giulio, just 275 meters long and 140 meters wide, and no more than 400 meters from the main square of Orta. The island shows traces of settlements as far back as the Neolithic era but it was abandoned during Roman times. 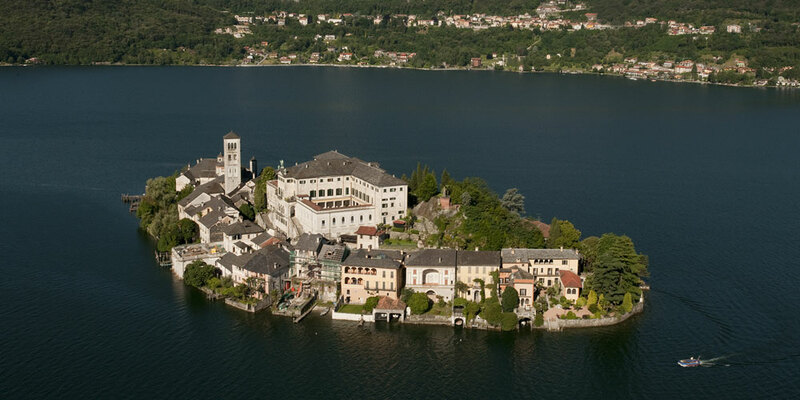 It was also thought to be a pre-Christian cult center, a very good reason for which the two Greek brothers, Giulio and Giuliano, arrived on Lake Orta at the end of the 4th century. They were Evangelists who sought to build churches in order to spread the Christian faith but separated for a while as Giuliano built their 99th Church in nearby Gozzano and Gulio went on to Orta to seek a site for their 100th Church. According to legend, the Island was at that time infested with serpents and dragons, obvious symbols for Evil or pagan practices that foundation of the Church would wipe out. The local fishermen were naturally afraid of the monsters and refused to take Giulio to the Island. He was determined and brave, however, and reached the Island by throwing his cloak on the waters and stepping onto it was taken there as if by magic. There he defeated the dragons and serpents and founded his 100th church, in the very same place the current Basilica now stands. The present day Basilica goes back to the 12th Century and was designed on the model used for the cathedral in Novara. Quite apart from its very fine frescoes, do not miss the extremely rare and precious pulpit carved in green marble from Oira, supported by 4 much older columns. The pulpit itself is richly decorated with symbols that are dear to Christianity and the figure of a man who could well be the Abbott Guglielmo da Volpiano born on the island in 962. The undeniable charm and fascination of the island are not its sole attributes, it is just a little mysterious too, thanks to the presence of the Mater Ecclesiae Benedictine convent where there are now about 80 nuns living when in 1973 there were only six. They live in almost total silence with their Abbess Mother Anna Maria Canopi, the most important living female figure in the Catholic Church. The Island of San Giulio has a little road running round it called the Way of Silence which leads past ancient villas, walled gardens and wells and little alleys going down to the calm waters of Lake Orta. At intervals the messages of Mother Canopi can be read and if you walk around the Island in one direction, she shares her wisdom about Silence and if you walk in the other, she speaks of …………… But we will leave you to find the will to visit this magical place and take in her beautiful words, discovering small words of advice with great value for all who wish to live more happily with themselves and with others.